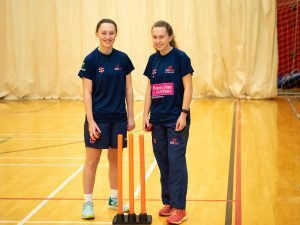 Three talented sportswomen from Llandarcy Academy of Sport – part of NPTC Group of Colleges will be jetting off to the Caribbean this spring to play in a Cricket Wales tournament in Barbados, and they need your help! Twins Kelsey and Seren Hughes, and Alex Griffiths are representing Wales Women in a competition that will see them playing nine matches in twelve days against a Barbados Academy team, and a number of teams in the local area. The tournament will play a key role in Wales Women’s pre-season programme, ahead of an exciting season which sees them compete in Division One of the T20 league. “It’s going to be a great opportunity for the squad, as a preseason tour to get prepared for the upcoming season, especially as we are now in Division One of the T20 league”. “We get lots of support from the lecturers. They give us training opportunities, which help us develop our cricket, and we benefit every day from the great facilities here at Llandarcy Academy of Sport. The three talented youngsters have high ambitions for their sporting futures. 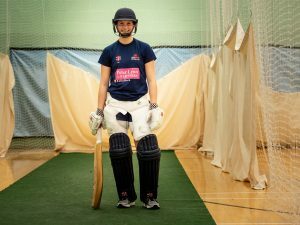 They are aiming to progress onto representing Western Storm (A women’s Twenty20 cricket team from the South West of England) and then eventually to represent 2017 World Champions England Women. The team are seeking sponsorship for the tour and are creating a brochure with advertising space for sale. This brochure will be circulated around the cricket population of Wales so it’s a great way to get your business noticed and support the future of women’s cricket in Wales at the same time! If you are interested in sponsoring Kelsey, Seren, Alex and their teammates, there are a range of packages available. Please contact sali-ann.millward@nptcgroup.ac.uk for more information. We offer a wide range of Sport and Public Services courses across NPTC Group of Colleges.